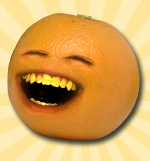 The internet sensation Annoying Orange has a new episode this week, even though mostly a teaser to the next Annoying Orange video, Annoying Orange gets an Upgrade, to be released next week. It seems the makers of this web series has chosen an idea repeatedly suggested by us fans. And it's going to happen next Friday. Annoying Orange will be meeting a mystery guest head-on. There are only two funny lines to compensate for the episode being a cliffhanger though. But still, they're catchy. Orange (at the moon with Pear): Hey Pear, I don't think you understand the gravity of the situation. Orange (destroying a skyscraper): Whoa, laser eyes! Who's your bet for this mysterious guest? Mine is Homer Simpson. Though highly unlikely, it will be hilarious if the two meet and try to annoy each other and then say "D'oh!"